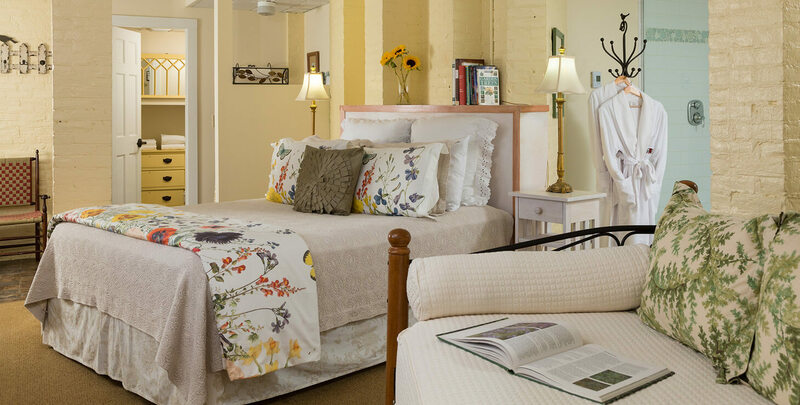 The Garden Spa suite is our largest guest bedroom, offering numerous comforts and amenities, making it one of the best places to stay in Burlington, Vermont. The suite includes the convenience of a small refrigerator and tea kettle (along with mugs, tea bags, sugars). Additionally there is an intimate dining area and a desk and chair (for those who bring their work with them!). Also in the suite is a wood and wrought iron daybed, which provides a comfortable place to sit. From there, one may enjoy the warmth of the Vermont Castings gas stove along with a bottle of wine, and our Vermont Artisanal cheese plate. The Garden Spa room is accessed by a private, outdoor entrance at the back of the inn, making for an easy walk to Church Street or Burlington’s amazing restaurants. Guests walk down five steps to find themselves in a basement-level room with exposed brick and fun, garden themed accents.